Today marks Whitney Houston's anniversary. 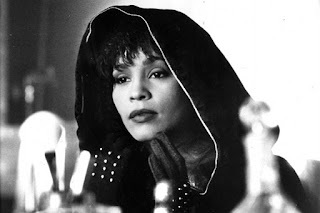 There are few people in the world who do not know her iconic name or indeed this iconic image from the movie The Bodyguard. She was an American recording artist, actress, producer, and model. She sold over 175 million albums, singles and videos worldwide as of her death in 2012. Whitney started out singing in her local church choir. Music was in her blood as her cousin was the famous Dionne Warwick, her mother Cissy Houston and aunt Aretha Franklin. With Movies like 'The Bodyguard', 'The Preacher's Wife' and 'Waiting to Exhale' under her belt, her last movie, released posthumously, was Sparkle. She turned down a role on The Cosby Show back when it all began and I can only be thankful for that because we might not have known her as the Whitney Houston we still adore today. Whitney was found drowned in her hotel room just before the Grammys 2012.